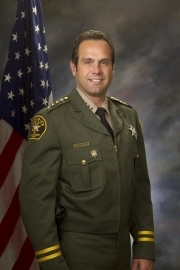 San Luis Obispo County Sheriff Ian Parkinson was sworn into office on January 3, 2011. Parkinson's career in law enforcement in San Luis Obispo County began when he joined the Morro Bay Police Department in 1984. He transferred to the San Luis Obispo Police Department in 1988, where he rose to the rank of Captain, second in command of the department. In recognition of his outstanding service, he was twice awarded the department's "Distinguished Service Award." In 2004, Parkinson was also awarded the City of San Luis Obispo Employee of the Year. The Sheriff has been an associate faculty member at Allan Hancock College since 2001, where he taught traffic accident investigation. Currently the Sheriff teaches leadership development for active duty police officers. During his career in law enforcement, Sheriff Parkinson was assigned virtually every assignment available to a police officer, including: major crime investigator, training officer, traffic officer, lead defensive tactics instructor, narcotics investigator (Situational Oriented Response Team), field supervisor, and administrative sergeant. Parkinson assisted in directing the development of the first San Luis Obispo County Regional SWAT Team. The Regional SWAT team consists of members from San Luis Obispo, Paso Robles, Arroyo Grande, Grover Beach, Pismo Beach, Cal Poly and Morro Bay Police Departments. In 2012 Governor Brown appointed Sheriff Parkinson to serve on the California Rehabilitation Oversight Board. He served on that board until June of 2014 when Governor Brown appointed Sheriff Parkinson to the California Seismic Safety Commission. The commission investigates earthquakes and researches earthquake-related issues and makes recommendations to the Governor’s Office and the Legislature about policies to reduce earthquake risks. In January 2015, Sheriff Parkinson was sworn in for a second four year term, having run unopposed in the previous election. Sheriff Parkinson was re-elected to a third term in 2018 and took the oath of office in January 2019.